Makai Ocean Engineering, Inc. was established in 1973 as a diversified ocean engineering and naval architecture company providing service primarily in Hawaii and the Pacific. In Makai’s early years, we took a technical lead in a number of innovative projects that helped develop a unique set of skills and expertise. Deep water pipeline design for energy applications, marine vehicles and deep water cable installation software development were some of those projects. Today Makai’s services have greatly expanded, and we are more global in nature. Our clients are found throughout the world. Makai has developed a broad spectrum of engineering expertise and provides services in research and development, design, construction engineering support, construction management, testing, and systems analysis, cable lay planning, analysis and support and other diverse operations in the marine field. Makai takes pride in providing innovative award winning design solutions to complex ocean engineering challenges. Our personnel have extensive engineering, software development and technical backgrounds and are experienced in working on new and unique projects and in the preparation of comprehensive design documentation, specifications, cost estimates, engineering reports and presentations. Makai has developed a unique and powerful culture where creativity, intelligence, hard work, and independence are celebrated. These values are tempered with respect, humility, flexibility, and an open, cooperative demeanor. Our engineers truly love working here and they feel as though they are part of a carefully selected team of only the very best engineers. Makai has about 30 employees, with 25 engineers who hold advanced degrees and experience in mechanical or civil engineering, computer science, physical oceanography, physics, and chemistry. We are seeking engineers who want to be the best at what they do. At Makai you’ll have the opportunity to make significant contributions that advance the state-of-the-art of your profession. Interested in joining the Makai team? Sign-up for our newsletter to stay up-to-date on any available positions and to keep an eye on Makai! Makai is a great place to work. 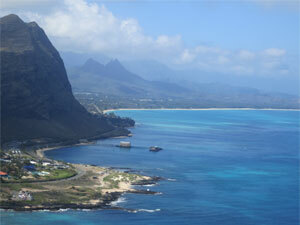 Our office is on Makai Pier in gorgeous Waimanalo, Hawaii, featured in National Geographic Magazine. 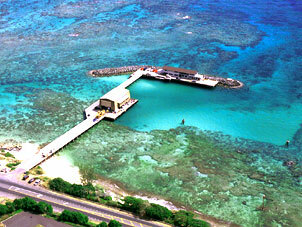 Overhead view of Makai Pier from the cliffs of Makapuu. 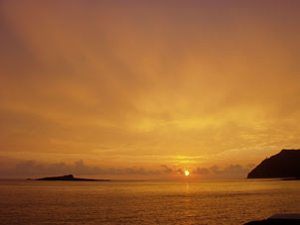 Sunrise of Makapuu Point as seen from Makai’s offices.